Further to my post last week, let's model the communication from teacher to parent, considering just a single subject for simplicity. 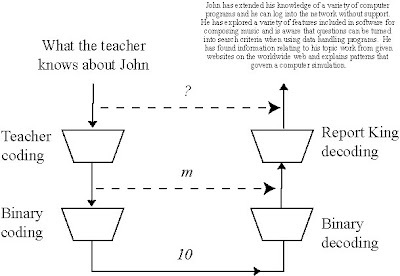 The teacher know lots about John, but inputs into the software just the name ("John", which is the address of the message), and the selection from one of fours levels, choosing in this case "m" (which is the message payload). This is how I see the communication using the layered model and trapeziums to represent the coding and decoding (see my chapter in Ramage and Chapman or read the posts labelled trapezium in this blog). The interesting bit, of course, is the layer above. The pretence is that the whole paragraph that the parent reads has been communicated virtually from the teacher. The reality is very different. 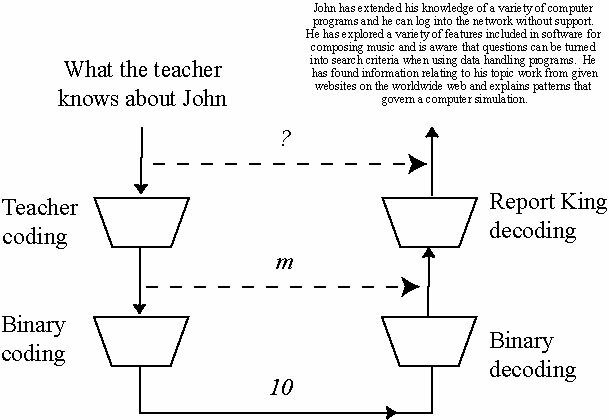 The teacher - hopefully - does know lots about John and could communicate a full paragraph (and much more), but actually they have encoded their entire knowledge of John into the choice of 'm' (that John is an "average to more able achiever"). It was Report King that generated the paragraph. A key point is the mismatch between the encoding and the decoding. The binary decoding just reverses the binary encoding, but the teacher encoding is different from the Report King decoding. Not entirely different of course, because the school teaches to the National Curriculum which the Report King uses the National Curriculum to do the decoding - that's why the Report King system works at all. Apart from the message about information inflation, which is where this discussion started in last week's post, this model draws attention to the role of the encoding and decoding in communication. For example, decoding can never be perfect (even the binary decoding might get it wrong), and since they happen at different times and/or different places in some senses they are always completely independent? That's for further exploration at another time.